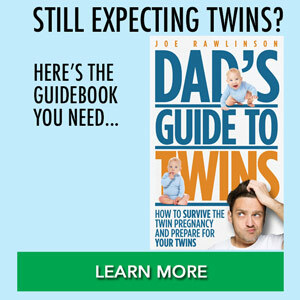 I want to share an article I found from another father of twins who is blogging at Double Doodie Dad. This post in particular is written by his wife and it’s from the mom’s perspective of what happens when dad goes back to work and mom is left home alone with the twins. 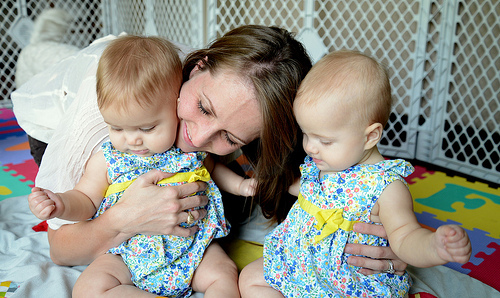 In the case of this family, Dad went back to work when the twins were about five weeks old, and the mom recounts that the first day was the worst and she struggled most of the day to figure out how to get both babies happy at the same time. Eventually she starts to fall into the pattern of finding out what works. I do recommend that you read this post, because it gives you a very raw and honest look at what life is like home alone with the twins when mom or dad goes back to work. It will give you some good perspective of what to expect if that hasn’t yet happened for you, or you can compare notes and see what’s happening. Bottom line is at the end of the day mom collapses in a pile of exhaustion and tears while Dad and Grandma come and help take care of the twins in the evening. The truth is that taking care of twins by yourself is completely exhausting mentally and physically, and oftentimes you’re neglecting your own personal needs and you struggle to find a pattern or something that’s going to work consistently with your twins. Now this article does end on a positive note, as the mom recommends that you enjoy every moment because the twins are constantly changing. Your twins are constantly growing and you might just end up going back to work and miss out on a big chunk of the day with your babies. So enjoy the small moments with them, even though it can be overwhelming. After reading this article I realized that there are things we can do as dads to help Mom when we head back to work. Things that we can do to help prepare Mom and prepare the house and the babies so that the transition is a little bit more smooth than it could be otherwise. So I have six tips for you on things that you can do to help prepare for leaving Mom at home alone with the twins, because eventually even though we may have a generous paternity leave as fathers, we’re not going to be able to stay at home indefinitely if the plan is to go back to work. So the first thing we can do is stock up on baby supplies. Now your mom when she had you way back in the day probably stayed home with you and took care of you. Same thing is going to be the case here. As mom is staying home with the twins, you need to make sure that she has everything on hand that she needs to care for the babies. She’s not going to be venturing out to the store in those early weeks, especially as she’s trying to master handling both twins at the same time by herself. So you want to make sure she doesn’t have to go to the store. Make sure you have a ready supply of baby gear, baby diapers, food if you’re doing formula for the babies, and the equipment she needs to take care of them. The second tip is to make sure mom has easy to grab and eat food for her, for mom. Too often mom is so occupied with caring for the babies that her own nutrition and energy is a second thought. And so she’s not going to have a lot of time to prepare food, cook a nice big lunch or dinner and so what you need to do is make sure mom has healthy food that she can eat throughout the day as she gets a quick second that she can eat whenever she has a small break between caring for the babies. Food prepared in advance will help her take care of herself.. So number three, practice soothing both babies at the same time by yourself before your spouse goes back to work. Now when both mom and dad are home in the newborn weeks after delivery, it’s very tempting to always let one of the parents take one of the twins and you just divide and conquer that way. And then so in doing you never get a true taste of what it’s going to be like after the twins are home alone with Mom or home alone with Dad. And so what you need to do is practice. Practice in a safe place where you have a backup. Don’t fall for the temptation of always letting your spouse help before your spouse goes back to work. This could just be for a few hours, it could be for an evening or it could be for the night shift that you take turns taking care of both babies by yourself. 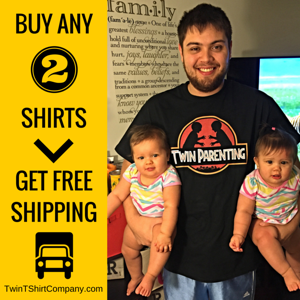 This will help you get to know the individual quirks and personalities and the physical logistics of handling both twins at the same time. Okay, tip number four is that you can let mom get a good night’s sleep before you head back to work. This could mean that you take the night shift, Dad, taking care of and feeding the babies throughout the night. This is going to work especially well if Mom is pumping breast milk or if you’re formula feeding your babies which is what happened with us. Number five is to recruit help if at all possible. I talked about this in the past because it is such a blessing to have someone else come in and help. 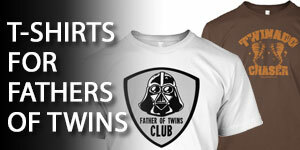 So if mom or mother-in-law or neighbor or friend or baby sitter can come over and help with the twins, even for a few hours, it’s going to relieve mom greatly and be a huge benefit to her. Okay, so number six is make sure that everything is prepared around the house before you leave for work. This means that all of the baby clothes, all the onesies, all the outfits are clean and folded and ready to grab, that the baby bottles are cleaned and prepared or maybe are pre-prepared with formula, everything is staged and where it should be so that when Mom goes to grab something, it’s where she expects it to be and there are plenty of those items. You don’t want mom to have to run out to the garage to get something or into the closet or where she does not have what she needs ready to serve the babies. So if you can do a handful of these things, it will definitely help alleviate some of the burden of leaving mom home alone with the twins when you go back to work. So keep in mind the things that you can prepare physically around the home, maybe some help that you can give mom and definitely practice ahead of time so mom knows what to expect when you head back to work. 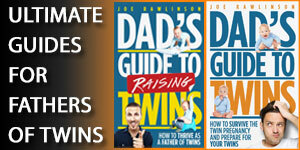 Read more about this big transition in Chapter 3 of my book, the Dad’s Guide to Raising Twins: How to Thrive as a Father of Twins. This topic was originally addressed on the Dad’s Guide to Twins Podcast Episode 74: How to Prepare Mom for When You Go Back to Work. Picture by Donnie Ray Jones. 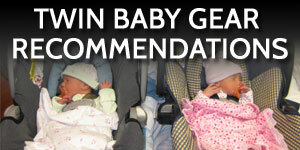 @Jillian – it is overwhelming raising twins, especially when they are very young. Nevertheless, it is a blessing I wouldn’t trade for anything else. ive been home with my twins and a 2.5 year old toddler since they were 3 weeks old. My husband comes home for lunch most days. I’m breastfeeding. I manage somehow. I found a pattern that works for me, and I can generally accomplish a few tasks and make hot lunch for everyone. I even managed to potty train the toddler last week. That made me feel like a superhero. One of the biggest things that helps me — sometimes, someone is going to cry and there is nothing you can do. And that’s ok. It’s ok for them to cry a little. It’s ok for you to be overwhelmed and hide in the bathroom for a minute to pee. It’s ok to have a cup of coffee or a piece of chocolate or call your mom at 9 in the morning to Cry. I dunno. Maybe it’s because the twins weren’t my first children, or maybe it’s my personality or the personality of the girls; but most days I manage everything by myself. I would love to have more help, but dh is busy too. And the girls are thriving. They’re only 3 months old though. Let’s see how I feel in another month; a year.. Two. @Lori – potty training a toddler while caring for infant twins? Yes, you are a superhero!